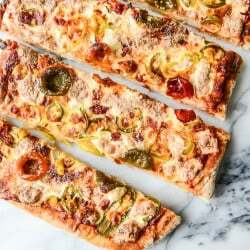 Hot and Sweet Triple Pepper Pizza. Oh hello my favorite friend. What does it mean if pizza is your BFF? Because I am officially declaring this the pizza of the summer. The flavor. It’s out of this world. And GUYS. We can’t stop making it! And now I have my brother and sister-in-law hooked on it too, and THEY can’t stop making it. And I never even liked spicy food before! Especially peppers. Or sauce! Oh my gosh. So many contradictions here. Way too many exclamation points. I’m eternally embarrassed and already annoyed. It’s with good reason, I promise. When I was first developing recipes for our summer eats project, I thought about including some of the milder jarred peppers on a pizza. Mostly because I adore all things briney and tart and they sounded better than sticking, well… PICKLES, on a pizza. I’m sure you feel me. But then I thought… what if I do some sweet peppers and some hot? And I was told that the high heat of the oven cooks out a lot of the spiciness in the peppers and before I knew it I had dumped an entire jar of dilly, spicy jalapenos on my sauce and cheese. It was not a bad decision. I have no idea what it was about this pizza that day, but it hooked us all. The toppings are SO simple yet the flavor combination is incredible and deliciously compatible. You can easily use fresh garden peppers, however they will lack that briney, vinegary goodness. 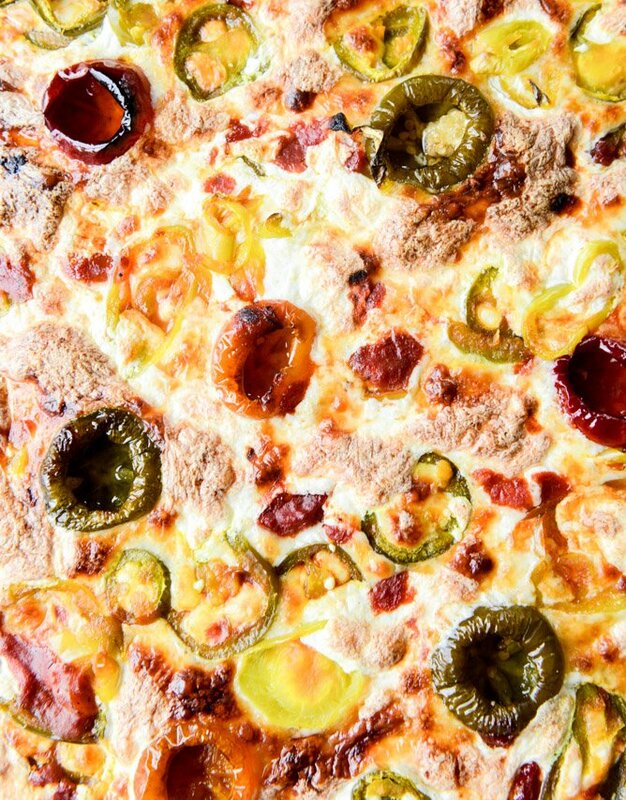 I wouldn’t skimp on any of the cheeses and I think it’s imperative to have hot AND sweet peppers, but you can also add a bit of pepperoni if you’re feeling it. Sometimes I’m feeling it. Also, I must tell you about the crust. We know that I’m a little fanatical about pizza crust. I’ve been making my own for years and aside from a ball or two bought from Trader Joe’s, it’s pretty much the only way we’ve eaten pizza that isn’t delivery unless its faux-ed on a fluffy blanket of naan. So. Before I had Max, I made three whole wheat crusts and froze them. That was an awesome idea but I kept forgetting to defrost them (I’d remember at 5:30pm) and they as hard as a rock. The thing is that I happen to think that pizza crust is fairly easy to make. I always use honey and rarely have problems with yeast and have tried to convince Eddie that he can do it (!!!!!) because it’s foolproof and I’m not even a real baker. But. He really wasn’t into that and in February, walked through the door with a bag of this new DeLallo’s dough. I was 1. jealous because I didn’t even know about it, having not been out of the house in weeks and 2. thrilled because I figured this meant that he’d make pizza and my appetite was totally outrageous. Needless to say, he did make pizza and we really liked this crust. 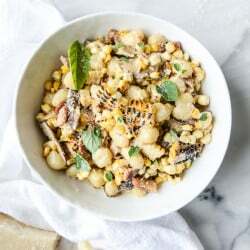 If the day has been hectic and I didn’t get to make dough in time for dinner, Eddie will make this when he gets home and it rises in about 30 minutes. It’s thick and fluffy like my garlic bread pizza crust and I’ve even tossed some herbs in the flour too. But enough! These toppings are so fantastic that even if you don’t have time for pizza, put them on toast or something. Just do it, get them, stuff them in your face. Sweet and salty and cheesy and spicy and gahhhhh. Who am I and how is this pizza my new life? I’m loving it. Prep the dough and once it’s ready to bake, roll it out on a well floured surface. If I’m using a baking sheet, I’ll sprinkle a bit of fine ground cornmeal on the sheet before rolling out the dough to loosely fit. (If I’m using a pizza stone, I’ll usually preheat the oven and stone to 475 degrees F.) Rub the dough with olive oil then cover it in the tomato sauce. Add on half of the cheese (provolone, mozz + fontina), then cover the pizza evenly with a mixture of the peppers. You can use fresh garden peppers, but they won’t have the vinegary tang! Top it with the remaining cheese 3 cheeses, saving the parm for after. Bake the pizza for 20 to 25 minutes or until the cheese is golden and bubbly. Remove the pizza and let it cool slightly before covering in the grated parm and slicing. Serve! I totally want to hide out in that spicy little pepper cave up there. Pizza my best friend? Yup Yup. But I could compete with your husband for carnivore of the century. I’m ashamed to admit it, but when there’s no meat item for dinner, I complain to wife. I know…..!!! This is bad. I could just make dinner myself. I get it. So no comments out from on my blog about my low standards please! Okay then, it’s pizza tonight, with both the sweet and hot peppers like you suggest. Dr.’s orders. ohhhh lordy, give me all of the peppers!!! This looks so good! I just need to say, DUDE you are so winning life!! Can we hide together in that peppery cave? This pizza is smoking hot, I love it Pinning! Peppers + pepperoni is a winning combination. Homemade pizza is just the best. Making this immediately! SUCH a good idea! I really want to try that pizza dough mix!!! So this looks amazing! I love peppers and I always end p eating all of them that come WITH the pizza. I love this idea! I’m seeing a lot of pepper in that pizza and I’m loving it. Yum. Spicy pizzas like this are my favorite! I’m definitely pinning this and putting it on the menu plan for next week! This pizza looks so great! I made a pizza yesterday and it tasted great! But now I wish I had some peppers because I know it would taste even better! I am starting to get hungry just thinking about it! Looks delicious. Do we still get to see a post about your brothers wedding? Lord have mercy. 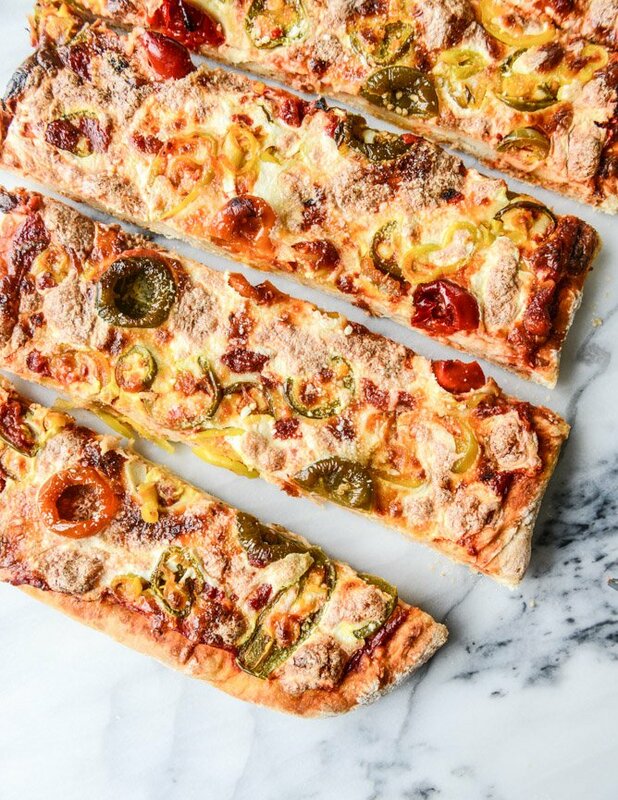 This recipe has come just in time for Friday pizza night! So excited to try it because it sounds absolutely diviiiiine! Peppadew peppers. That is all. Pizza squares! That is one colorful pizza. I’d be the first in line to try all those colors. Funny you should mention the spice thing because I never was much of a spicy food fan… but now I can’t get enough. I especially love it all over my pizza (hello red pepper flakes!) Point being: this needs to happen. Yes! Anytime the peppers are served up, especially on pizza, I will be there. You are calling my name. Very nice. I am so obsessed with pizza! Yum! I love pizza and that looks yum. I think it is vegetarian, too, am I right? Bahh I love lots of peppers! I’ll just have to convert my family over. This seriously looks so good! OMG yessssssssssss. I am going to make this pizza and eat it ASAP! Pepper and Pepperoni has been a favorite of ours for awhile. Make it in our Breville Pizza Cooker. Thin crust with light touch of red sauce with sharp cheddar + mozzarella + feta and thick cut pepperoni, red onions and banana peppers. Delish!!!!!! Will toss some cherry peppers on next time. Yum!! !